Need more information about booking Home 6946542 ? 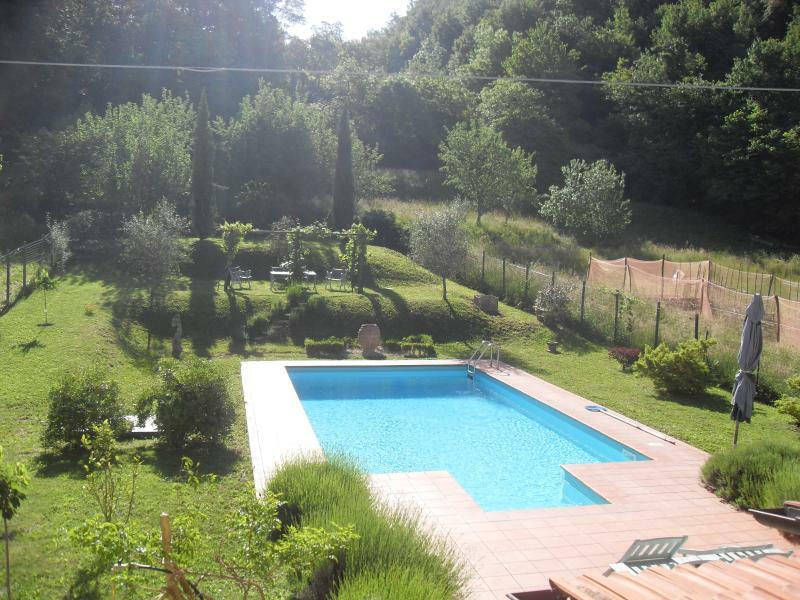 Our large detached family villa is set in the heart of the idyllic Tuscan hamlet of Po, situated high in the hills just outside Fivizzano. With breathtaking views across the mountains it is the perfect location to relax away from it all. The newly renovated villa comprises 4 large bedrooms (one with ensuite), and a large family sized bathroom. It has a traditional hallway and small balcony offering views across the mountains and valley. Downstairs consists of a large lounge with wood-burning stove (for the colder winter months), a dining room that seats 8, a newly fitted kitchen as well as a small shower room and toilet. With a private swimming pool, large terrace and well maintained garden it is the perfect place for enjoying the Tuscan sunshine or al fresco dining. The villa is surrounded by beautiful woodland with a number of picturesque nature walks featuring panoramic views over unspoilt countryside. If you are lucky you may spot eagles, wild boar or see the hundreds of fireflies that light up the garden in early summer. Situated less than an hour's drive to the nearest coast, 1hr to Pisa and 2hrs to Florence makes this an ideal location to base your Tuscan adventure from. More locally Po has it's own bakery selling fresh artisan bread and local produce, there is also a small bar within walking distance for your morning cappuccino or evening gin and tonic. You can get in touch with Philip (the owner) through the contact form on this page. Send Philip (the owner) an email through the contact form on this page. Alternatively, if there’s a phone number on this page, you can call them. How do I contact Philip (the owner)? If you’ve already booked, go to Manage your holiday booking to view Philip the owner's contact details or send them a message. Or send Philip (the owner) an enquiry through the Contact the owner/manager form if you’d like a quote or more info first. When you pay online through the Book your stay form, a booking request is sent to Philip (the owner). You’ll find out within 24 hours whether they’ve accepted - no money will leave your account before then. You can also request a quote from Philip (the owner) through the contact form. The owner will email you the total cost for your dates and a link to book and pay online. Use the Book your stay form to pay provisionally online. You can pay by credit/debit card or PayPal. Philip (the owner) will have 24 hours to accept the booking and no money will leave your account before then. Why can't I call Philip (the owner) before booking? You’ll need to contact Philip (the owner) to do this. Send them a message in Manage your holiday booking or through the contact form on this page. You can request to change the dates or number of people on your booking via the Manage your holiday booking page. To change your holiday dates use the Edit booking button. If you need to change the number of guests staying then send Philip (the owner) a message. If Philip (the owner) agrees, they’ll send you a revised quote outlining the changes. You can review and accept/decline this from the Manage your holiday booking page. You’ll have 48 hours to take action before the revised quote expires.